Since the beginning of 2008, the 11 largest prescription pharmaceutical manufacturers have shed a combined 143,536 jobs according to data collated by Bloomberg. Merck & Co. – which announced 8500 job cuts last week as part of an initiative to "sharpen its commercial and R&D focus" – has undergone the biggest reduction in headcount over the past five years. 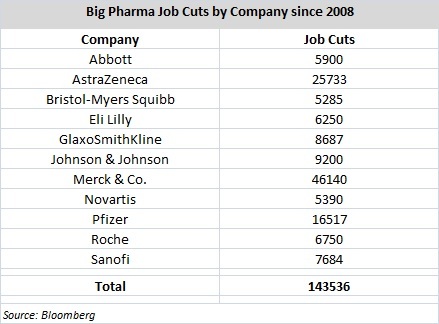 The US pharma giant has cut 46,140 jobs since the beginning of 2008, including 15,000 job losses in early 2010 as a result of the Schering-Plough acquisition a year earlier. A further 13,000 jobs were cut in 2011, which equated to a post-merger reduction in staff numbers of around 30 percent. Loss of US exclusivity for Merck's asthma treatment Singulair was cited as a pre-cursor to the 2011 cuts and likely also played a role in last week’s announcement. See Spotlight On: The data behind the job cuts – 5 reasons why Merck & Co. was forced to wield the axe. AstraZeneca has cut its workforce by the second highest amount over the past five years, having reduced its head count by 25,733 staff. Over that period, the company has on three occasions announced cuts in excess of 5000, most recently in April. Indeed, since March of this year, the company has reduced its headcount by approximately 9000 people as CEO Pascal Soriot looks to redirect the company’s strategy and commercial outlook. Pfizer has shed 16,517 jobs since the beginning of 2008, but notably made the vast majority of these cuts in two announcements prior to the loss of exclusivity for Lipitor in late 2011; Pfizer cut 8180 positions in 2009 and a further 6000 jobs in 2010. Subsequently, Pfizer has cut only a further 1600 positions. Loss of exclusivity for key blockbuster products has acted as the key driver for Big Pharma’s trend to cut jobs over the past five years, both due to the impact on revenue but also pharma’s ability to reduce its sales and marketing spend as a result. It is perhaps no surprise then that the number of job cuts across the Big Pharma peer set peaked in 2010 (40,146 job losses) – just ahead of the co-called 'patent cliff' in 2011/12. Big Pharma’s rate of headcount reduction has subsequently declined, although Merck’s announcement last week demonstrates that there is scope for further streamlining. One analyst suggested, for example, that Eli Lilly could be a prime candidate for cost cutting should its pipeline not deliver as anticipated over the next few years. To read more List articles, click here. FirstWord List – Pharma's top 50 growth drivers – where do they come from? ViewPoints: Time to throw the kitchen sink – aducanumab included – at Alzheimer’s?